Highlands Stud part of Ridgemont’s four times Equus Outstanding Stallion Dynasty enjoyed yet another memorable weekend this past week, with Dynasty offspring shining both at awards ceremonies and on the racetrack. Dynasty’s champion son It’s My Turn, South Africa’s Equus Champion Stayer for 2017-2018, picked up his fourth and fifth awards respectively for the past season when he was crowned KZN Racing’s Champion Stayer and Champion Older Male at an awards ceremony on Friday evening. 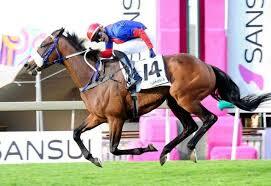 The Willem Engelbrecht Jr bred It’s My Turn had previously won the above mentioned Equus Award, the Cape Racing’s Champion Stayer award and the Cape Breeders’ Champion Stayer award. It’s My Turn, one of four G1 Investec Cape Derby winners sired by Dynasty, has won five times and earned R2 801 275 in stakes. His victories last season included all of the G3 eLan Gold Cup (another Dynasty son, Wild Wicket, ran third in the Gold Cup), G3 DStv Gold Vase and G3 Track And Ball Derby and he was an unlucky exclusion from the 2018 Vodacom Durban July (where Dynasty son Made To Conquer finished second). His sire was also in the limelight on South African racetracks this weekend, with Dynasty responsible for three very impressive local winners. 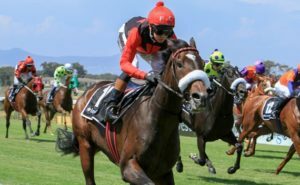 His son Majestic Mozart became Dynasty’s first winner over the weekend, when the Candice Bass-Robinson trained colt shed his maiden impressively when scoring by 1.75 lengths over 1400m at Kenilworth on Saturday. The 3yo colt, who was bred by Highlands, was making just his second outing and is held in high regard by his connections. Out of the Theatrical mare Sound The Flute, Majestic Mozart is bred on the same Dynasty/Theatrical cross as G2 Premier Trophy winner and G1 Investec Cape Derby second Dynamic. Dynasty’s second winner this weekend came when his high class son Noble Secret (as 9-20 favourite) sauntered to a 1.25 length (despite being said to be only 80% fit) in an assessment plate over 1600m at Turffontein on Saturday. The Mike de Kock trained gelding had been placed in three legs of the Triple Crown last season and last time out ran third in the G1 SA Derby. Regarded as a live hope for the G1 Summer Cup (won in 2017 by Dynasty son Liege), Noble Secret has now won or placed in all seven of his starts and has already banked more than R500 000 in earnings. Dynasty had yet another smart winner this weekend when his Lammerskraal Stud bred and owned daughter Perfect Air made it three wins on the bounce when scoring a two length win over 1400m at Greyville on Sunday for trainer Dennis Drier and jockey Sean Veale. The lightly raced four-year-old has now won three of just five outings and looks to have a bright future ahead of her.